This page was suggested by Terry Cisco, who contacted Bob Eisenhart to help us with the post. Many thanks! The Eisenhart connector is a great example of a broadband transition, designed before EM solvers existed. The problem Robert (Bob) Eisenhart solved was how to connect 7mm coax to 25 mil alumina and get ultra-low VSWR to 18 GHz, for FET transistor characterization; his transition provides 1.05:1 VSWR from 8 to 18 GHz! Both Bob and Terry worked together at Hughes Aircraft Corporation back in the Canoga Park days. The solution was a tapered pin that gradually becomes offset from the center of the coax; the exact cross-section of the pin can be calculated from offset coax equations to get exactly 50 ohms. 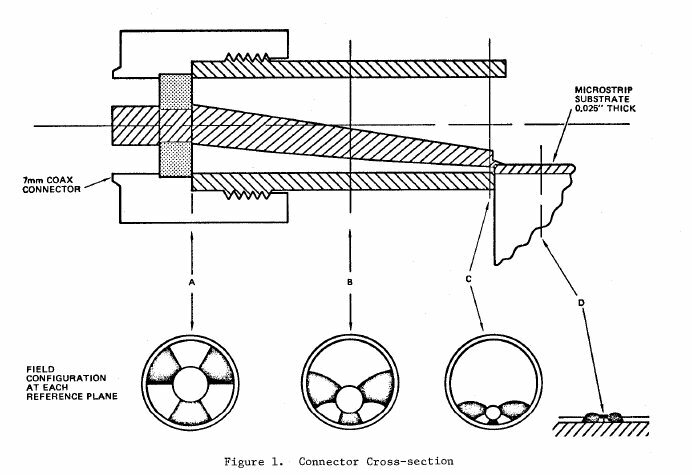 Eisenhart published a paper titled "A Better Microstrip Connector" at IMS in 1978, see reference below. The Eisenhart connector became a product line for Cascade Microtech during the 1980s. It earned patent #4,280,112, as "Electrical Coupler", on July, 21, 1981. A pdf of the patent is available below. The connector was marketed through Cascade Microtech for many years before they focused solely on planar probes. The original transition hardware is displayed in the IMS MTT-S Historical Exhibit, you might be able to view it at the next IMS. Here is Eisenhart's patent, already downloaded for you. R.L. Eisenhart, "A Better Microstrip Connector" 1978 MTT-S International Microwave Symposium Digest, pp. 318-320.